Jonathan Davenport celebrates his $12,000 Lucas Oil Series victory at East Bay. What won the race: Regaining the lead on a lap-37 restart, Jonathan Davenport of Blairsville, Ga., raced to his second Lucas Oil Late Model Dirt Series victory of the season Friday at East Bay Raceway Park. Davenport outran Tyler Erb in winning his sixth career Wrisco Winternationals race at East Bay. He earned $12,000. On the move: Jeff Mathews of Brandon, Fla., started 25th and finished 10th. Points chase: After East Bay Friday: 1. Earl Pearson Jr. (720); 2. Jonathan Davenport (710); 3. Tyler Erb (690); 4. Scott Bloomquist (635); 5. Devin Moran (560); 6. Josh Richards (540); T7. Tim McCreadie (525); T7. Don O’Neal (525); 9. Jason Jameson (515); 10. Hudson O’Neal (470); T11. Jimmy Owens (440); T11. Gregg Satterlee (440); T13. Billy Moyer Jr. (425); T13. Kyle Bronson (425); 15. Jeff Mathews (415). GIBSONTON, Fla. — Jonathan Davenport of Blairsville, Ga., regained the lead from Tyler Erb of New Waverly, Texas, on a lap-37 restart and led the rest of the way to win Friday’s 50-lap Lucas Oil Late Model Dirt Series main event at East Bay Raceway Park. Davenport earned $12,000 for his second victory of the week in the 43rd annual Wrisco Winternationals. Erb — trying to become the first driver to win three Winternationals races in the same season since Hall of Famer Billy Moyer of Batesville, Ark., in 2015 — settled for second for the second time this week. The 22-year-old driver in his first season with Ohio’s Best Performance Motorsports, has a pair of East Bay wins and hasn’t finished worse than third in five starts at the tricky third-mile oval in the south Tampa suburbs. Series points leader Earl Pearson Jr., of Jacksonville, Fla., finished third, while Scott Bloomquist of Mooresburg, Tenn., and Devin Moran of Dresden, Ohio, rounded out the top five on a night when points finally mattered, as the four previous nights at East Bay were not points races. But the all-important points on the line, along with an increase in prize money (the week’s earlier features paid $5,000 and $7,000 to win) and additional laps (50 compared to 25 Monday and Tuesday and 40 Wednesday and Thursday) did little to change the dynamic of week that’s featured three primary standouts: Davenport, Erb and Pearson. The trio has been indeed been terrific though the first seven races of the Lucas Oil Series season. Just 24 hours after Erb and Davenport made incidental contact — resulting in Davenport tagging the wall — while battling for the lead in a race Erb eventually won, Davenport responded with a convincing victory of his own. Davenport, the polesitter, took the lead on the opening lap, but couldn’t pull away because of two early cautions, one on lap six when heat winner Colton Flinner of Allison Park, Pa., smacked the wall in turn three, and another on lap 10 for Ryan King of Seymour, Tenn., who slowed with a flat tire on his Warrior Race Cars house car. Three laps later, Erb, with new-found momentum on the high side, mounted a challenge for the lead. He streaked by to lead lap 15 while Pearson shuffled Davenport back to third. Erb was able to ease away during a long green flag run, but when Clint Bowyer Racing teammates Don O’Neal and Josh Richards made contact on lap 35 triggering a caution one lap later, Erb’s 1.891-second advantage was erased. A single lap was completed before a spin by Hudson O’Neal drew the race’s fourth yellow flag, giving Davenport the opportunity he needed. Diving to the inside of the leader on the restart, Davenport muscled his way back into the lead. Once ahead, Davenport took advantage of a track surface that became increasingly more difficult to pass on. Pearson, who now has finishes of second, first and third in the tour’s three points races, was a little disappointed that the track developed a clearly dominant groove in the later stages of the race. Notes: Jonathan Davenport won his sixth career Wrisco Winternationals race at East Bay. Along with his two victories this year, he as two wins each in 2016 and 2018. … 16 of the 26 starters completed all 26 laps. … After Stormy Scott spun in turn four on lap 46 to bring out the seventh and final caution, Davenport pulled away to win by 1.932 seconds. … Tanner English of Benton, KY., who started fourth and ran inside the top five for most of the race, retired on lap 45 with a broken rearend in his Stone-Weaver Racing No. 116. … After finishes at East Bay of eighth and 11th to go along with two wins and Thursday’s disappointing 15th-place finish, Davenport is happy with the progress of his Lance Landers-backed team. “We just keep on gelling as a race team and we start, just talking through our problems and I think it shows that we found something,” he said. … Erb said he and crew chief Randall Edwards continue to tweak on the Best Performance Motorsports Rocket XR1. “We found a couple things we messed up on just tuning on this thing the last couple of nights and I think we got it figured out,” Erb said. … Austin Rettig of Sikeston, Mo., gained entry into the feature by winning the Berry Barn Strawberry Dash for the second night in a row. 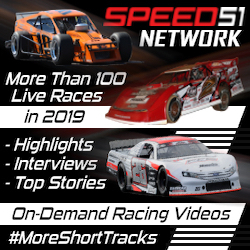 … Tim McCreadie’s sixth-place finish was the Watertown, N.Y., driver’s best Georgia-Florida Speedweeks finish this season, topping Tuesday’s 10th-place finish. Row 1: Jonathan Davenport, Earl Pearson Jr.
One year after winning the Friday-night Winternationals feature, Jonathan Davenport will go from a repeat starting from the pole position. … Colton Flinner entered the Winternationals having never won a Lucas Oil Series heat race; after capturing the fourth prelim, he’s now topped two in the last three nights. … The fourth-starting Flinner was the only heat winner and the lone racer mong the top six A-main starters without a Winternationals feature win on his resume. A total of 20 career Winternationals triumphs are represented by the five other drivers in the top six. … Michael Lake, a 17-year-old from Uniontown, Pa., experienced the wildest accident of the week in the first heat when he tagged Vic Hill’s spinning car in turn four, sending his own machine into a gyration that ended with Lake’s car precariously balanced on its left side. He was uninjured but had to wait for the safety crew to lower his car onto its wheel with a tow truck’s boom before he could climb out. … Morgan Bagley likely saw his week at East Bay come to an early end due to engine trouble during hot laps that was determined to be terminal. He said he won’t have another motor to bolt in his car until he gets to Volusia Speedway Park in Barberville, Fla., on Monday; he said he’s scheduled to pick up a fresh powerplant that Clements just finished today in time for Volusia action. 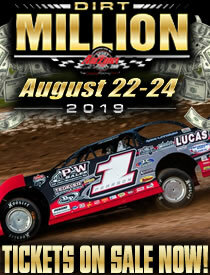 Finish (winner transfers): Austin Rettig, Chad Stapleton, Allen Murray, Joey Moriarty, Tyler Carpenter, Joel Callahan, Dan Stone, Kerry King, Freddie Carpenter, Jonathan Rowan, Colton Horner, Rusty Schlenk. Scratched: Johnny Pursley, Matt Cosner, Greg Oakes, Blair Nothdurft, Shanon Buckingham, Geoffrey Carey. First consolation (top three transfer): Stormy Scott, Kyle Bronson, Devin Dixon, Tim Dohm, Jonathan Rowan, Jeff Mathews, Johnny Pursley, Tyler Carpenter, Joey Moriarty, Kerry King. Second consolation (top three transfer): Terry Casey, Ryan King, Jason Jameson, Gregg Satterlee, Austin Rettig, Chad Stapleton, Matt Cosner, Rusty Schlenk, Joel Callahan, Greg Oakes, Allen Murray, Freddie Carpenter, Shanon Buckingham, Geoffrey Carey. Emerging from a three-wide scrum in turn one on the opening lap, Colton Flinner of Allison Park, Pa., pulled away from Tanner English and Hudson O’Neal to lead the entire distance. Flinner turned back an inside charge from Tanner English and a late run by Josh Richards to pick up his second heat win of the week. Richards rallied after a caution appeared on lap seven for Shanon Buckingham. Flinner won, with English second and Richards third. O’Neal finished fourth. Finish (top four transfer): Colton Flinner, Tanner English, Josh Richards, Hudson O’Neal, Austin Rettig, Matt Cosner, Rusty Schlenk, Chad Stapleton, Shanon Buckingham, Freddie Carpenter. Getting the jump on the opening lap, four-time Lucas Oil Series champion Earl Pearson of Jacksonville, Fla., controlled every lap of the third heat, winning ahead of Jimmy Owens. The low-running Pearson turned back advances from the high-running Owens early in the race before shifting his line up the track en route to the win. Owens was second, with Tim McCreadie finishing third and sixth-starting Don O’Neal fourth. Outside front row starter Colton Horton spun on lap four in turn four to draw the lone caution. Finish (top four transfer): Earl Pearson Jr., Jimmy Owens, Tim McCreadie, Don O’Neal, Ryan King, Terry Casey, Gregg Satterlee, Jason Jameson, Allen Murray, Greg Oakes, Colton Horner, Geoffrey Carey. Polesitter Tyler Erb of New Waverly, Texas, dominated the second heat. Easily taking the lead ahead of Tim Dohm on the first lap, Erb rolled to a 1.617-second win over third-starting Mike Benedum. Dohm, the outside front row starter, got a horrible start and fell back to eight on the opening lap and never recovered. Devin Moran advanced from fifth to finish third behind Benedum and Justin Williams finished fourth to transfer into the main event. Finish (top four transfer): Tyler Erb, Mike Benedum, Devin Moran, Justin Williams, Devin Dixon, Jonathan Rowan, Blair Nothdurft, Tim Dohm, Johnny Pursley, Joey Moriarty. Scratched: Kerry King. After an aborted first start, Hall of Famer Scott Bloomquist of Mooresburg, Tenn., grabbed the lead ahead of Jonathan Davenport of Blairsville, Ga. Davenport wrestled the lead away on lap three, but Bloomquist reclaimed the point with a cross-over move at the flagstand only to have a caution wave for a turn-four accident. On the restart, Davenport bolted ahead and cruised to victory, with Bloomquist 2.245 seconds back in second place. Eighth-starting Austin Hubbard grabbed the third spot and Billy Moyer Jr. took advantage of Kyle Bronson’s last-lap bobble to claim the fourth and final transfer spot. The only incident was on lap four when Michael Lake got on his side after careening into the spun car of Vic Hill in turn four. Both cars were heavily damaged. Lake was reportedly OK. Morgan Bagley of Longview, Texas, scratched for the evening after engine problems in his No. 14M were worse than originally thought. Bagley is likely finished for the week. Finish (top four transfer): Jonathan Davenport, Scott Bloomquist, Austin Hubbard, Billy Moyer Jr., Kyle Bronson, Stormy Scott, Dan Stone, Jeff Mathews, Tyler Carpenter, Vic Hill, Michael Lake. Scratched: Morgan Bagley. Returning to the track after sitting out on Thursday night, Scott Bloomquist of Mooresburg, Tenn., set the overall quick time among the 44 drivers who took a qualifying lap. Bloomquist stopped the clock at 14.525 seconds in the first group to earn the pole position for the first heat. “We were just playing with some things, testing some things (for) early in the year. Some of it worked some of it didn’t so we just went back with what we know works,” said Bloomquist while accepting his fast-time award. Earl Pearson Jr. of Jacksonville, Fla., was the quickest in the second group with a mark of 14.880 seconds and will start from the pole of the third heat. Other heat race polesitters: Tyler Erb of New Waverly, Texas (second heat) and Tanner English of Benton, Ky. (fourth heat). Morgan Bagley of Longview, Texas, and Geoffrey Carey of Georgetown, Del., each failed to log a qualifying lap. Bagley was busy trying to repair a broken valve spring, while Carey made a half lap before pulling to the infield. With the absolutely perfect weather conditions continuing — yet another day with sunny skies and a high temperature around 80 — Night 5 of the Wrisco Industries Winternationals brings a 46-car field. … While Scott Bloomquist of Mooresburg, Tenn., is back in action this evening after being suspended from Thursday’s action as part of his penalties from Lucas Oil Late Model Dirt Series officials for having another driver start Tuesday night’s feature in his car, four drivers who competed on Thursday are not entered. That group includes three racers — Brandon Overton, Billy Moyer and Brian Shirley — who left East Bay to run the conflicting World of Outlaws Morton Builders Late Model Series doubleheader at Screven Motor Speedway in Sylvania, Ga. — and Devin Gilpin, whose Jim Beeman-owned team is still on the grounds but opting not to race after struggling throughout the week. … Tim McCreadie of Watertown, N.Y., has struggled through the first four nights of the Winternationals — his finishes (in order) are 13th, 10th, 15th and 14th — but he noted that it’s more of the same for him at East Bay. He did note, however, that he feels he’s running better with his newly-Bilsten-shod Longhorn house car than he did last year at East Bay. … Josh Richards of Shinnston, W.Va., is ready for the first night of Lucas Oil Series points racing during the Winternationals with a fresh engine bolted into the Clint Bowyer Racing car he scratched from Thursday’s program due to an apparent burnt piston while qualifying. … Allen Murray of San Antonio, Texas, wore a big smile on Friday afternoon after registering an East Bay career-best finish of ninth in Thursday’s feature. He started 21st and went to the rear after spinning on a lap-10 restart but rallied to crack the top 10. “We were just so good off the bottom,” Murray said. “I was hugging those tires off two and passing cars. It was fun.” … Ryan King of Seymour, Tenn., appeared primed to contend for a top-10 or better finish in Thursday’s feature until seeing his hopes abruptly end when he was involved in a turn-two scrape with Brian Shirley on a lap-15 restart. King’s Warrior house car was left with a crushed right-rear deck after being clipped by the spinning Shirley, who had slipped out of the groove after coming together with Tanner English of Benton, Ky. … Morgan Bagley of Longview, Texas, has scratched from qualifying after breaking a valve-spring in the power plant of his No. 14M. Bagley hopes to make repairs in time to run his heat. With a stirring late-race rally, Hudson O’Neal of Martinsville, Ind., surprised leaders Tyler Erb of New Waverly, Texas, and Earl Pearson Jr., of Jacksonville, Fla., to win Thursday’s 40-lap Lucas Oil Late Model Dirt Series main event at East Bay Raceway Park. O’Neal, 18, became just the third teenager to ever win a Winternationals main event at East Bay, while he and his father, Don O’Neal, are just the second father-son combo to win an East Bay Winternationals feature, joining the late Jack Boggs and his son Jackie in accomplishing that feat. With the victory, O’Neal is also the third driver to win an East Bay feature during the 43rd annual Wrisco Winternationals, joining two-time winner Erb and Wednesday’s winner Jonathan Davenport of Blairsville, Ga. While Erb, Davenport and Pearson, the series points leader, have been the class of the field thus far, the intensity will likely ratchet up a notch on Friday as drivers compete in the first of the tour’s two point-paying events at the slick third-mile oval on the outskirts of Tampa. Series heavyweights Josh Richards (engine issues on Thursday), Scott Bloomquist (returning from a one-race suspension due to a rules infraction on Tuesday) and Jimmy Owens (plagued by uncanny bad luck) are among drivers looking to bounce back heading into the weekend.